Innovation is no longer a value addition, but a necessity for survival. Innovation drives growth and breathes life in an industry. This is true even in the Service industries, where competition is high and the only way to beat it is through innovation. In many service industries, employees are happy doing their assigned work and believe that innovation is not required in their world. Many service firms have tried changing this idea by encouraging innovation and providing a platform to innovate and showcase. But, they have failed in one critical aspect. They have failed in making their employees realize the need to innovate. As an illustration, consider the problem of a software service company serving a multi-national bank with online banking applications. A portal to discuss and showcase innovative ideas does not necessarily encourage the employees to innovate, though it’s a required infrastructure. The employees need to understand the need to innovate. Even in cases where the importance of innovation is communicated, innovation is inhibited due to one or all of the following reasons. In this hack, we suggest an experiment that will test our hypothesis. This experiment can be carried out on a small client account within the organization. To implement and test the hypothesis, the company must form a team called the ‘Innovation Team’, that understands our framework completely. This is a small team that helps the delivery teams to initially implement the framework and equips it with the skills and tools to carry out such initiatives in future. The ‘Innovation Team’ may comprise of members of the Innovation Office and members of Learning and Training Department. The Innovation team shall have a budgeted allowance to carry out the experiment. To test the hypothesis in the experiment, the Innovation team will be provided with a timeline to implement the initiative. 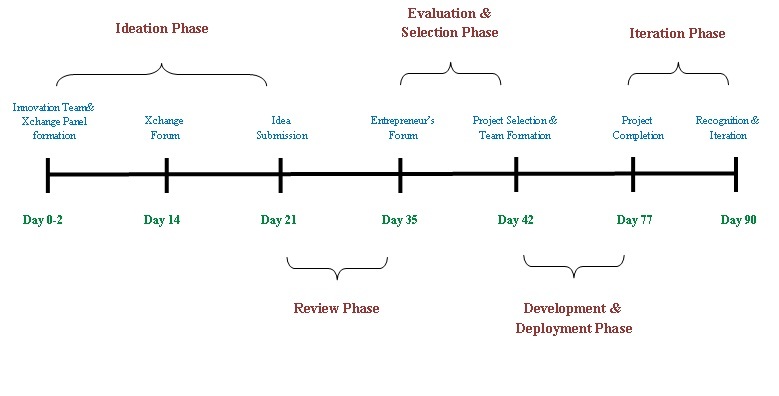 The timeline is divided as Ideation Phase, Review Phase, Evaluation and Selection Phase, the Development and Deployment phase and the Iteration Phase. In our experiment, the innovation team will choose a client account to conduct the pilot run of the experiment. While choosing, it should consider an account that handles lesser number of projects, relatively less complicated system but a one which has a higher scope for innovation. The account should be interested in carrying out experiments and willing to fund initiatives. By restricting the experiment to one particular account, the risk of the initiative is contained within that account and the risk of failure will also be limited owing to the size and complexity of the system within. The Innovation team should finalize the team within 2 days of the roll-out of the initiative. Once it chooses the account, it must select the ‘Xchange Panel’ that is instrumental in carrying out the experiment. A good panel is the one that incorporates people from different business functions and one that can visualize the bigger picture. The scope of this panel is limited to the account and its deliverables. Delivery head/manager of the account, who will understand the resource requirements and project feasibility. Representative from the Marketing team of the product or service which the account handles, who will understand the offering’s competitive status. Customer – A guest of honor position. Industry experts/Market Analysts – A guest of honor position. The ‘Innovation team’ will help the panel to conduct the ‘Xchange forum’ and ‘Entrepreneur’s Forum’ effectively. In order to streamline the experiment, the account team could come up with a theme that is taken up during the Xchange forum discussion. The panel with the help of the ‘innovation team’ could choose one of the above themes. For understanding the consumer, the company can conduct a survey. The consumers in our illustration are the bank account holders using the online banking facility. The delivery team can design the questionnaire for the survey. The results of this campaign should be shared across with the account. This would help employees understand the end-user perspective. This would give them insights about what the consumer perceives as being important as opposed to their own view. (The survey could be conducted by an in-house team or a different company could be hired to conduct the same). The customer in our example is the Bank for which the software company is providing services and to understand them the employees can be sent for field-study tours. For this exercise to be successful, it is imperative that the employees understand the areas where they can improve their product’s offering to either increase the product’s efficiency or reduce the operational difficulties in managing the product. It is quite necessary to understand the competitor’s services to be competent in the market. An added perspective in this regard can help the team to come up with new innovative ideas to be a leader in the competition. Now we introduce the ‘Xchange Forum’, which is part of the Ideation Phase, where the different perspectives acquired are put to test. Role playing is one of the critical links in understanding the different perspectives. In these forums, the delivery team plays the role of the ultimate end-user and the Xchange panel plays the role of the immediate customer. In our illustration, the application delivery team plays the role of online banking customer and the Xchange panel role play as the bank. The Client, role-played by the Xchange panel, tries selling the new service, which is a project currently being executed and due to be completed soon, to the end user, played by the service delivery team. In our example, consider the bank trying to launch a new online net banking utility to its new and existing credit card customers. The End users, who are the employees with the added perspectives, will then analyze the new product/service comparing it with its competitive offerings. They may find the product/service truly valuable, mildly valuable or least valuable. This provides the delivery team with a perspective of the end-user and makes them realize the true value of their offering. In our experiment, the Xchange panel will be created by the Innovation Team and together they will organize the field study and Xchange Forums. Team members from the delivery team can be chosen to interact with the clients and understand the value that they add to them. The Innovation team and the Xchange panel will even help the selected members to come up with possible questions that they can ask the client. The knowledge from the interaction will be shared across by the study team to rest of the team members. This particular exercise will be given two weeks time for completion. At the end of the second week, i.e. at the 14 day of the start of the initiative , the Xchange Forum shall be conducted with the Innovation team helping out both the players, employees and the Xchange Panel as how to drive the discussion and how to put the different perspectives into practical test. The role of Innovation team will be to drive the discussion to have tangible learning and to focus the thoughts. The success of the forum will be measured by arriving at broad areas of improvement, where profitable projects can be pursued, through discussion among the forum players. The fund required to carry out these activities will be partly borne by the account and partly by the Innovation team. Every team member, having realized the true value he/she is adding and with an added perspective of the end-user, will feel the need to innovate and would want to contribute more than the regular work. He/She, motivated by the exercise, comes up with ideas to delight the end-customers, which he/she can present to a panel, which plays the role of venture capitalists. This forum is called the ‘Entrepreneur’s Forum’. The Entrepreneur’s Forum is part of the Evaluation and Selection Phase. The Development team member, now on called the Entrepreneur Employee, is required to build his own team of delivery and management and has to convince the VCs to fund their idea. The ‘Innovation Team’ will help the employees to pen down their ideas by providing Idea Brief document (The template for Idea Brief document is attached in the document section) to explain his/her idea and the benefits that it can derive. More than serving the purpose of idea illustration, the Idea Brief document will help in streamlining the thought and identifying the areas of consideration. The idea, obviously, has to be feasible amongst the constraints of real implementation, which may include conflicts with other projects and so on. The ‘Innovation Team’, along-with the panel, can come-up with evaluation criteria to screen the ideas, in case of large number of ideas. Basic evaluation criteria are described below for illustration purposes. Complexity to benefit ratio. Complexity may cover resources, process/activity changes required. Benefit can be a score as identified in the value added section. A measure of change in other projects and BAU activities due to the new project. This is not the monetary impact but the functional and technical changes that may be required in other projects to accommodate the new projects. How easy is the project to implement? Example, the system down time and so on. Probability of client accepting the project. Time to implement the project. More the time, higher the cost score. The skill-set, number and time, resources are required for the Incubation, Development and Implementation. Resources can be any human resources, software requirements and even mentors time. Incremental cash flow due to the project. This could be the Loss in the cash inflow from other projects, due to the resource reallocation. Change in the system behavior/use after the implementation of the project. The estimated cash flow increase for the client. Increase in intangible benefits for the client. This can be better customer experience, faster processing, and greater flexibility and so on. The probability of any substitute providing similar values. The Ideas which clear the initial screening during the Review phase can then be invited for the Entrepreneur’s Forum to present the idea in front of the Xchange Panel. The Xchange Panel can use the Evaluation Criteria table to score each of the project idea against the identified parameters. Based on the score, the winning Entrepreneur Employee/s can be selected and all the required resources will be allocated. They will also be allowed to hold the positions they had announced for in the idea presentation. This practically means that even a small time coder with the new idea is allowed to be a project manager for his/her own project. Also, the Xchange Panel will select a team of mentors to help the project team with their delivery and implementation. A project manager will be chosen to mentor the Entrepreneur Employee who takes up project management, a senior technical consultant will mentor the technical lead and so on. More than just mentoring, this particular setup will encourage and motivate the senior team members to help and support such initiatives. In our example, assume a team of web developers in Software firm coming up with a new chat facility for existing customers with the customer care executives. They can form their own team of developers and managers, estimate the time and budget of the project. They will be presenting their idea to the Xchange Panel, explaining the idea, the benefit to the customer (the online banking customer), plans to mitigate conflicts with other projects and delivery schedule. After the idea selection and some corrections, the panel may approve the plan and the required fund and resources will be allocated, along with a team of senior members to mentor the team. In our experiment, the Innovation team and the Xchange Panel need to play a very crucial part in drafting the Idea Brief document. The employees may be motivated and could have found a new, exciting idea but equally important is to make it feasible by addressing all the concerns. They may not be aware of the interactions that the system involves and other areas of consideration. The Project Management office will help the employees in identifying the budget and schedule considerations for the project. In brief, the Project Management office will help the employees to convert their idea into a business project. The team can be given one week time for building up their idea and making the Idea brief document. On Day 21, they are expected to submit their Idea Brief documents. The Xchange panel and the Innovation team can take another week time to screen and shortlist initial set of feasible ideas and on the 35th Day from the initiative roll-out, the Entrepreneur’s Forum shall be conducted. The role of Innovation team is critical in conducting the Entrepreneur’s Forum as both the players, the Xchange Panel and the Entrepreneur Employee, may not totally understand their role in the Forum. The output and success of the forum will be measured by the selection of a feasible project idea and formation of a delivery team with mentors. Now with the development team, formed along with the mentors, has to arrive at a detailed project schedule and work on the deliverable as part of the Development and Deployment phase. The team has to report to the Xchange panel regarding their milestone achievements periodically. The funds and other resources shall be allocated to the project team at each milestone achievement and after the satisfaction of the Xchange panel. Any issues that may be encountered shall be addressed with priority. When the project is half complete, the pre-sales team can start pitching the product. This would give the sales team sufficient time to market the product to a customer who was already in the panel. (We believe that since the customer was/is on panel, he/she already knows the product). Once the project is delivered successfully within the time frame, the team/organization can present it to the client, proving the value it will add to the end-customer. In our example, the Software firm can present the completed enhancement to the bank, emphasizing on the value it adds to the customers of the bank. Internally, the Entrepreneur Employees need to be recognized for the idea and implementation, by providing a percentage of the revenue the service/product may garner (if the revenue generated cannot be specifically traced back, then a percentage of estimated revenues can be shared), training programs to enable them to help them take-up the roles they had played during the project development and so on. In our case, if the entry-level coder has showcased his skill in project management, he/she is now in the talent radar and can be nurtured to take up such responsibilities in future. The mentors can be recognized by making them part of a bigger, efficient team known for grooming talents, namely, the Talent Group. This kind of incentive to an ideating employee is dramatic and creates a significant impact among the community to ideate, implement and continue on their stride. In our experiment, the project delivery team and the mentors are formed within 7 days and on Day 42, the team is ready to develop and deploy. The client account delivery team will have the primary responsibility of helping the project delivery. The funds for the project shall be provided by the account as the ultimate benefit would be realised by that particular account. Also, the understanding is that the Xchange Panel had chosen the project on the realization that the project would yield financial and other tangible benefits. It is the onus of the client account delivery team to provide the delivery team with the required human resources. The team can make use of the reserve resources, which most of the big software firms term as ‘Bench’ to fill in the resource requirements. The Xchange Panel will be entrusted with the responsibility of making sure that the project milestones are reached and funds are allocated appropriately. The project team will be given a time frame of 5 weeks to complete the project. At the end of the successful project completion, the Xchange Panel and the Innovation team should recognize the teams with organization-wide communication, best practices identification and other rewards, which can take 13 more days. On the 90th day of the initiative roll-out, the Innovation team is ready with the pilot run learning and for the next iteration. Along with honouring the successful team, all the participants must be recognized, even those whose ideas did not make it through the ‘Review Phase’. This can prevent a negative sentiment from spreading amongst the employees. The ‘Innovation Team’ can come up with a book containing a collection of all these ideas and acknowledging the participants in company-wide meetings. Once the pilot project has been successfully implemented, the ‘Innovation Team’ should plan an organization-wide implementation. However, the roll-out should be done in a phased manner. This would help to address problems in a systematic way and help to develop a more robust system. This culture of innovation would slowly but surely be implanted in the working styles of the employees and our hypothesis would become a reality! The framework primarily aims at cultivating an environment of innovation, ownership and implementation in the service organizations. Creation of the innovation team that understands the ‘Entrepreneur Employee’ framework completely. The innovation team should be capable of educating and training the delivery managers about the framework and helping the delivery heads in the implementation of the framework. Defining the parameters to identify the most suitable team in the organization to run the pilot phase of the framework. Defining the protocols for each entity of the framework. This should be customized according to the implementation organization’s strategy and business model. Designing metrics to measure the performance and outcome of the framework entities. We thank Mr. Michele Zanini for his invaluable feedback and coaching us through the development of idea by providing us with some interesting and insightful management tools. We would also wish to extend our thanks to Mr. Jeremy Clark for giving us feedback to kick-start the second phase. Our Hearty wishes and thanks to our Associate Dean of W. Sycip Graduate School of Business, Prof. Ricky Lim for guiding us through the project and providing us with the much required confidence. Thanks to all our AIM friends for their wishes and encouragement. If every one of us puts herself as the end user of the product, will my attitude towards my work and deliverable will change? Most of them came out with suggestions and "innovations". First on how to avoid the rework and second on some kind of design tweaking so that as an end user themselves they would be delighted to use the application / product. I think this continual improvement attitude beyond one self need to become in grained for any business to deliver at the top all the times. I think every one of us should dawn multiple hats - so that the end product is developers pride and customer delight.